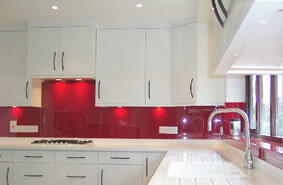 Glass Bonding We recognised as experts in the field of glass bonding using Ultra Violet light Decor Glass Leeds. Glass and Glazing. We are recognised as experts in the field of glass bonding using Ultra Violet light. This has many uses including glass furniture and retail displays. The advantage of these adhesives is their easy and clean application as well as extremely short curing times and high stability.